Macular degeneration or age-related macular degeneration is the most common cause of loss of vision in Americans above 60 years. It causes deterioration of the central, sharp vision. Central vision is needed to have a clear vision and to perform tasks like driving and reading. AMD affects the part of the eyes that allows us to see fine details, called the macula. It does not cause much pain; but leads to the death of the cells in the macula. 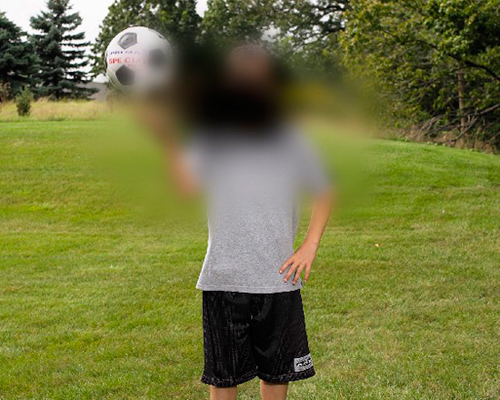 In some patients, AMD advances too slowly for people to notice changes in their vision. 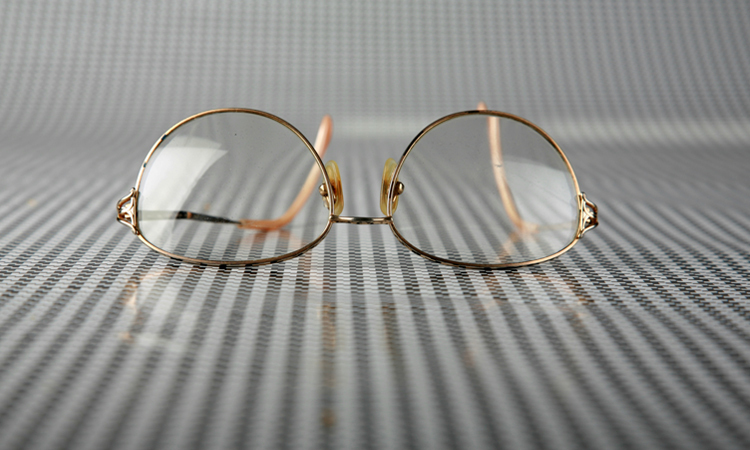 In some, the condition progresses faster and leads to vision loss in both the eyes. Undergoing comprehensive eye examinations regularly can help in detecting macular degeneration before it causes vision loss. Treatment can help in slowing down this complication. However, it can not restore vision. Retinitis pigmentosa or RP refers to a group of inherited eye conditions. The symptoms of RP such as night blindness usually precede tunnel vision by several years to decades. Most patients with RP do not become blind completely until they reach their 40s or 50s and tend to retain some sight during their life. 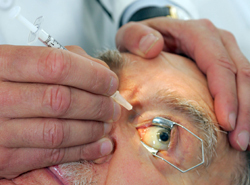 Most patients go completely blind due to RP, sometimes as early as in childhood. Progress of RP varies among different patients. RP is a form of progressive retinal dystrophy, a group of genetic disorders characterized by abnormalities associated with the photoreceptors (cones and rods) or the retinal pigment epithelium (RPE) of the retina, resulting in progressive vision loss. Affected people first develop abnormal dark adaptation or nyctalopia (night blindness). This is usually followed by decrease in the peripheral visual field (called tunnel vision) and on some occasions, loss of central vision in the later stages of the disease. Typical mottling of the RPE with blackish bone-spicule pigmentation is indicative (or pathognomonic) of RP. 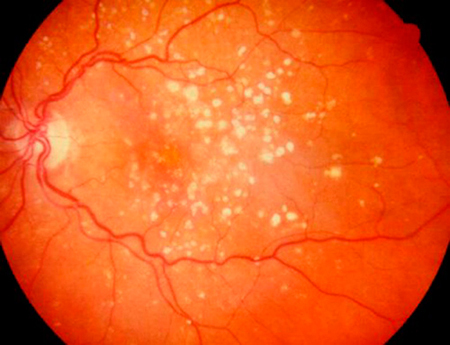 Other features of this disease are thinning or attenuation of the retinal vessels, waxy pallor of the optic nerve head, cystic macular edema, posterior subcapsular cataract and cellophane maculopathy. The diagnosis of RP can be confirmed after documentation of gradually progressing loss of functions of the photoreceptor by performing visual field testing and electroretinography (ERG). The mode of inheritance of RP can be determined by the family history of the patient. Minimum 35 different genes or loci have been identified as the cause of “nonsyndromic RP” (RP, which does not occur as a result of any other disease or a part of wider syndrome). A corneal ulcer, also called ulcerative keratitis and an eyesore, is an inflammatory, or in serious cases, an infective disorder of the cornea that causes disruption of the epithelial layer of the cornea along with involvement of the corneal stroma. This condition is very common in humans especially in the agrarian and the tropics societies. In developing countries, children having deficiency of Vitamin A are at a higher risk of developing corneal ulcers. They may also become blind in both the eyes, which often persists lifelong. The cornea is a transparent structure, which forms a part of the outer layer of the eyes. It protects the contents of the eyes and helps in refracting light. The thickness of the cornea ranges between 450 and 610 micrometres. On an average, it is 550 µm thick in caucasian eyes. In Indians, the average thickness of the cornea is slightly lesser at 510 µm. The cornea is supplied by the trigeminal nerve via the long ciliary nerves. Some pain receptors are situated along the outer layers. The pressure receptors are situated deeper. Transparency of the cornea is a result of lack of blood vessels, keratin and pigmentation and due to the collagen fibers that are organized in tight layers. The collagen fibers cross along the full diameter of the cornea in a parallel fashion, allowing 99% of the light rays to pass through them without scattering. The outermost layer, the epithelium, is about 25-40 µm. It is about 5-7 cell layers thick. The epithelium helps to hold the tear film in place and prevents invasion of water into the cornea and does not allow disruption of the collagen fibers. This prevents edema of the cornea, which may give it a cloudy appearance. It also acts as a barrier for infectious agents. The epithelium is attached to the basement membrane, which also separates the stroma from the epithelium. The corneal stroma forms 90% of the thickness of the cornea. It comprises of the collagen fibers organized into multiple lamellae. The lamellae are organized in sheets, which can easily separate. Descemet’s membrane is situated posterior to the stroma. It is a basement membrane of the corneal endothelium, which forms a single cell layer separating the cornea from the aqueous humor. Ulcerations of the cornea heal by 2 methods: migration of the surrounding epithelial cells, which is followed by division (mitosis) of the cells, and by introduction of the blood vessels from the conjunctiva. The first method helps in rapid healing of small superficial ulcers. However, deeper or larger ulcers need the presence of blood vessels for the supply of inflammatory cells. Fibroblasts and white blood cells synthesize granulation tissue followed by scar tissues, resulting in effective healing of the cornea. The ulcer usually heals by the 4th day. Corneal ulcers are a very common eye disease in humans. They occur due to a trauma, particularly because of vegetable matter. They may also occur following chemical injury, infections and contact lenses. Other eye diseases that can cause corneal ulcers are entropion, corneal dystrophy, distichiae, and keratoconjunctivitis sicca (dry eye). Several microorganisms are known to cause infection, resulting in corneal ulcers. Among them are fungi, bacteria, viruses, chlamydia and protozoa. Bacterial keratitis occurs because of Staphylococcus aureus, Escherichia coli, Enterococci, Nocardia, Streptococcus viridans, Pseudomonas and several other bacteria. Fungal keratitis leads to severe, deep corneal ulcer. It occurs following infection by Aspergillus sp., Candida sp., Fusarium sp., as also Mucor, Rhizopus and other fungi. The characteristic feature of fungal keratitis is gradual onset and slow progression, with signs occurring more frequently than the symptoms. Small satellite lesions formed around the ulcer are also a common feature of fungal keratitis. A hypopyon is usually seen in this case. Viral keratitis also causes corneal ulceration. It usually occurs due to Herpes Zoster, Herpes simplex and Adenoviruses. It can also occur due to coronaviruses & some other viruses. Herpes virus causes a dendritic ulcer that can recur and relapse repeatedly over the lifetime of the patient. Protozoa infection such as Acanthamoeba keratitis typically presents with severe pain and is commonly associated with history of using contact lenses in swimming pools. Chlamydia trachomatis also contributes largely to the development of corneal ulcers. Superficial ulcers cause damage to a part of the epithelium. Deep ulcers have a tendency to extend deeper into or through the stroma and can lead to severe scarring or corneal perforation. Descemetoceles occurs when these ulcers extend through the stroma. This form of ulcer is more dangerous and can rapidly cause corneal perforation, if not treated early. The location of the ulcer varies, depending on the cause. Central ulcers usually occur due to trauma, exposure from facial nerve paralysis or exophthalmos and dry eyes. Entropion, distichiasis (inward turning of the eyelashes) and severe dry eyes cause ulceration on the peripheral part of the cornea. Immune-mediated eye disorders cause ulcers along the outer edge of the cornea and the sclera. Such disorders include rosacea, rheumatoid arthritis and systemic sclerosis that lead to a special form of corneal ulcer, known as Mooren’s ulcer. It has a circumferential crater-like depression of the cornea, inside the limbus, most often with an overhanging edge. Corneal ulcers are intensely painful due to the exposure of the nerve, and can lead to squinting, tearing and vision loss. There can also be indications of anterior uveitis including miosis (small pupil), redness of the eyes and aqueous flare (proteins in the aqueous humor). An axon reflex can lead to uveitis formation — stimulation of pain receptors in the cornea leading to the release of inflammatory mediators, like histamine, prostaglandins and acetylcholine. Diagnosis can be made by direct observation of a magnified view of slit lamp, which reveals the ulcer on the cornea. Fluorescein stain helps in defining the margins of the ulcer and can also reveal more details of the surrounding epithelium as this stain is taken up by the exposed corneal stroma and appears green. Herpes simplex ulcers have a dendritic pattern of staining. Rose-Bengal dye can also be used for supra-vital staining purpose. However, it can be highly irritating to the eyes. In descemetoceles, the Descemet’s membrane bulges forward and appears like a dark circle with a green boundary after staining since it does not absorb the stain. A corneal scraping can be performed and examined under the microscope using stains like KOH and Gram’s preparation to reveal the fungi and bacteria respectively. Microbiological culture tests are necessary for isolating the causative organisms in some cases. Other tests, which may be required, are an analysis of the functions of the facial nerve for detecting facial nerve paralysis and a Schirmer’s test for keratoconjunctivitis sicca. – Treatment of air embolism and De-compression sickness. – Enhances oxygen carrying capacity of blood. 2] Chelation therapy can also be administered for the removal of toxic heavy metals including plutonium, mercury, arsenic, lead, iron (including in cases of thalassemia), uranium and few other forms of toxic metal poisoning. The chelating agent can be administered via different routes such as intravenous, intramuscular or oral, depending on the agent used and the form of poisoning. The project director advocates the use of both these therapies; hyperbaric oxygen as well as chelation therapy, before beginning Regenerative Tissue Therapy (cells) treatment. The main reason behind this recommendation is that this way the infused Regenerative Tissue Therapy (cells) have better chances of getting accepted and engrafted in the damaged tissue or organ and they, in turn, swiftly begin the repair. Hence, the benefits of Regenerative Tissue Therapy (cells) therapy can be enhanced. However, this too should be determined on a case to case basis. The patient must be diagnosed with a relevant eye disease. Is resistant to conventional therapies. Has fulfilled the International Criteria for the disease. Visual acuity may or may not be slightly affected. The frozen Regenerative Tissue Therapy (cells) should at first need to be thawed in a warm water bath at a temperature of 37 degrees Celsius by continuous agitation. Precautions should be taken to avoid the Regenerative Tissue Therapy (cells) from getting exposed to bright light while thawing. The Regenerative Tissue Therapy (cells) are later collected in a syringe using a wide bore needle (18 No.). The syringe should be covered with a tape to prevent exposure to light. The wide bore needle ensures that there is no damage to the delicate Regenerative Tissue Therapy (cells). The infusion is given slowly over duration of 3-5 minutes in dim light with the help of a 23 gauge needle. It is important to keep a watch for any immediate transfusion reaction. The dose of Regenerative Tissue Therapy (cells) can vary depending on the case. It ranges from 30 to 100 million Regenerative Tissue Therapy (cells) to generate the desired response. A very low dose of 1 million may also be sufficient to generate positive results. We advise intravenous administration of the Regenerative Tissue Therapy (cells) in most cases. However, infusion via other routes like intra-arterial, intrathecal, sub-dural, subcutaneous, intramusclular, sub-arachnoid, intraocular etc. may be required in some special cases and specific disorders. Direct on-site delivery of the Regenerative Tissue Therapy (cells) exactly at the site of injury by direct on-site implantation (or injection) or by using special interventional techniques may also be made. The final decision regarding the exact dosage and mode of administration of Regenerative Tissue Therapy (cells) is taken after comprehensive deliberation, the depending cause and the extent of the ailment. It is best taken on an individual case basis. Each dosage of umbilical Regenerative Tissue Therapy (cells) should be preceded by GM-CSF a day before starting Regenerative Tissue Therapy (cells) infusion. The recommended dosage of GM-CSF for adults is about 5 microgram per kg body weight and for children; it is 2.5 microgram per kg body wt. – In most cases, all of the listed side effects do not occur. – Most often, these side effects are reversible. They go away after treatment is complete. – Side effects are often predictable in terms of their onset and duration. – There are several ways by which these side effects can be prevented or minimized. – There is no correlation between the presence and severity of the side effects and the effectiveness of the therapy. – After the first dosage of GM-CSF, a patient may develop low blood pressure, tachycardia, lightheadedness or flushing. This is known as the “first-dose effect,” as it does not occur with next doses. – CD 34+ cells for the purpose of this discussion are the cells similar to the hematopoetic cells carrying CD 34+ markers sourced from cord blood after isolation by using cell sorting or magnetic bead techniques. – Mesenchymal Regenerative Tissue Therapy (cells) for the purpose of this discussion are the cells similar to total nucleated cells sourced from the cord lining procured with intensive processing. 32-80 million Mesenchymal Regenerative Tissue Therapy (cells) + 10 to 40 to million CD 34 + cells over duration of 1 year. Duration: 8 to 20 million MSCs + 2.5 to 10 million CD 34+ cells over duration of 3 months (simultaneously with GCSF a day before Regenerative Tissue Therapy (cells). Approximate total dosage of Regenerative Tissue Therapy (cells) should be 100 to 200 million in order to generate a favorable response. – About 150-200 ml of bone marrow is collected in a blood bag, following strict aseptic precautions. The procedure should be performed in an OT after administering general anesthesia. – Regenerative Tissue Therapy (cells) are later processed and isolated, following the GLP and GMP standards. – The final volume of 5 to 10 ml is then infused intravenously within 6-8 hours of its collection. – As the Regenerative Tissue Therapy (cells) cannot be tested for bacterial contamination, it is necessary to provide an antibiotic cover before starting the infusion. – About 150 to 200 ml of adipose tissue is obtained in a blood bag by a plastic surgeon, by performing liposuction. This procedure should be carried out in an OT under general anesthesia. – Regenerative Tissue Therapy (cells) thus collected are processed and isolated following the GLP and GMP standards. – The final volume of 5 to 10 ml is infused intravenously within 6 to 8 hours of the collection. – The Regenerative Tissue Therapy (cells) cannot be checked for bacterial contamination. That is why; providing an antibiotic cover prior to the infusion is highly warranted. – The Regenerative Tissue Therapy (cells) are collected in a specially designed blood bag by performing a procedure known as “apheresis”. – This procedure is carried out with the aid of a well programmed cell separator (Kobe Spectra or Hemonitics) in an ambient environment. A cell separator helps to obtain the desired quantity of Regenerative Tissue Therapy (cells) (approximately 200 to 250 ml of Regenerative Tissue Therapy (cells)) from the blood stream. – Prior infusion of GM-CSF (in a dosage of 5 microgram per kg weight in an adult and 2.5 microgram per kg weight in a child) ensures maximum mobilization of the essential Regenerative Tissue Therapy (cells) from the bone marrow of the patient. Autologous Regenerative Tissue Therapy (cells) isolated from the skin, cornea, liver, teeth, small intestine, etc. – The Regenerative Tissue Therapy (cells) can be procured from any of these organs using sophisticated techniques that help in their isolation. The procedure should be performed in an OT under general anesthesia. – Regenerative Tissue Therapy (cells) are later processed and isolated following the GLP and GMP standards. – The final volume of 5 to 10 ml should be administered intravenously within 6-8 hours after the collection. – Regenerative Tissue Therapy (cells) cannot be checked for bacterial contamination. That is why; we advise giving an antibiotic cover before the infusion. Diverse progenitor cell populations like hematopoietic, mesenchymal, trophoblastic and some more primitive Regenerative Tissue Therapy (cells) can be isolated from the placenta or the amniotic fluid. At least, few of these amniotic and placental cells have a common origin, the inner cell mass of the morula. Most forms of progenitor cells isolated from these 2 sources have similar characteristics. The amniotic fluid and the placenta possess multiple progenitor cell forms from the developing embryo, such as fat, muscle and bone. Following harvesting of the blood cells obtained from placenta tissue (UPT), umbilical cord blood (UCB) and placenta blood (UPB) simultaneously for their content of nucleated cells, CD34 (hematopoietic stem progenitor marker) positive cells, the results indicated that the nuclear cells that are obtained from UPB and UPT contained three to four times than those obtained only from umbilical cord blood. The survival ability of the cells from UPT (Placental tissue) and UPB (Placental Blood) was higher than that of the cells from UCB (Cord Blood) under long-term cell culture conditions. These cells, when stored in liquid nitrogen, did not show much loss of CD34 (+) cells or total nucleated cell count. It also showed that UPT and UPB had more suppressor lymphocytes, which is very important for the prevention of graft-versus-host disease. These implications highlight the importance of placental blood and tissue collection and their processing together with the processing of the umbilical cord blood for the Regenerative Tissue Therapy (cells) transplantation. Regenerative Tissue Therapy (cells) that are obtained from amniotic fluid can be used to differentiate into several tissues of the body such as muscles, adipose tissues, nerve, cartilage, blood vessel, bone, etc. These cells are considered a valuable resource for the repair of cell, organ or tissues. The Regenerative Tissue Therapy (cells) procured from amniotic fluid are referred to as AFS (Amniotic Fluid Derived Stem) cells. They denote a stage intermediate between the embryonic and the adult Regenerative Tissue Therapy (cells). They are capable of extensive self-renewal, a most characteristic property of Regenerative Tissue Therapy (cells). These cells can be used for producing a broad range of cells that can be highly valuable for the therapy. AFS cells can also be found in plentiful in amniotic fluid, which can be obtained from the procedures that are carried out to examine cells for the prenatal detection of some genetic disorders – this procedure is known as amniocentesis. Childbirth is a very good source of amniotic fluid. The chances for a perfect match are higher due to its primitive nature. 1) They can be easily obtained by performing amniocentesis. 2) With their ability to double every 36 hours, they can be easily grown in large quantities to obtain large amount of Regenerative Tissue Therapy (cells). 3) ‘Feeders’ or ‘Factors’ need not be used for guiding them towards the desired cell line. 4) These cells do not produce tumors. This is the reason these cells are preferred over embryonic Regenerative Tissue Therapy (cells). 5) Specialized cells generated from these cells possess all three forms of cells existing in the developing embryo, namely ectoderm, mesoderm and endoderm. Hence, these cells can differentiate into any organ, cell or tissue of the body. 6) Just like the embryonic Regenerative Tissue Therapy (cells), AFS cells also have the ability to generate all types of adult cells. The project director advocates using Regenerative Tissue Therapy (cells) obtained from placenta, amniotic fluid and / or amniotic sac. These cells should be processed and isolated carefully. They are then cultured in a clean room following GLP and GMP standards and can be used for allogenic as well as autologous use just like the Regenerative Tissue Therapy (cells) isolated from cord tissue and cord blood, occasionally with concurrent hyperbaric oxygen and / or chelation therapy after administering GM- CSF. The selection of Regenerative Tissue Therapy (cells), their dosage, route of administration and relevant accompanying therapy differ on a case-to-case basis.